Small business people and solopreneurs shine in the brilliance of their own business, but not necessarily in maintenance of their WordPress website. Using social media to drive traffic to your site is one of the easiest ways to improve SEO for your business. 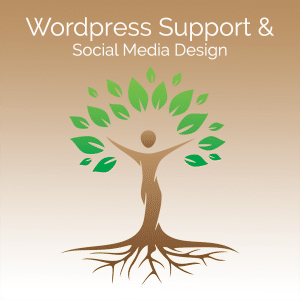 Are you able or interested in handling your WordPress maintenance on your own? Are you ready to create shareable graphics for your blog posts and social media? Whether the behind-the-scenes support or brand visuals, we can help. Support can be purchased on an hourly or monthly basis. The hourly rate is $85. Ongoing monthly clients are given first priority in the queue. I also offer a Website Care Plan which includes twice-monthly updates to your site theme and plugins, daily/weekly backups and security monitoring, all for a monthly fee of $47+. Care plans are available only for Web Medicine Woman-created sites. Exceptions may be made for sites created by other developers if with Genesis or Beaver-Builder-based themes. These are maintained at a slightly higher monthly cost. ** = “Minor site enhancements” is defined as tasks that take no more than approximately one hour to execute. By its nature, it would not include a website redesign or hosting configuration alternations such as PHP upgrades, site redirection, etc.